Martin Durksen: minister and teacher; born on 8 May 1919 to Johann and Katharina (Heinrichs) Duerksen near Kalentarowka, Russia. He was the youngest of thirteen children in the family. Together with his parents and siblings, Martin escaped through Germany to the Chaco, Paraguay, in 1929-1930. On 11 January 1941, he married Kaethe Duerksen in Paraguay. The couple had eight children, one of whom died young. In 1967, the family moved to Winnipeg, Manitoba, Canada and later worked in Ontario, Canada, and Germany. Martin developed diabetes and with his health deteriorating, he moved into Donwood Manor Personal Care Home in Winnipeg, Manitoba. He died on 16 February 1995 in Winnipeg and the funeral was on 21 February at the North Kildonan Mennonite Brethren Church. For some time, the family lived in Mentlertschik before fleeing the Soviet Union for Germany in 1929. The next year, Martin and his family left Germany for Paraguay, where they settled in the Fernheim Colony, Chaco. Martin completed his elementary and secondary education there. At the age of 16, Martin was baptized and joined the Evangelical Mennonite Church. After a year of Bible training, he completed his teacher training and worked as a teacher for six years in Fernheim, in the village of Gnadenheim. On 11 January 1941, Martin Durksen married Kaethe Duerksen in Paraguay. The couple worked with the Lengua Indians for three years before Martin entered the Mennonite Biblical Seminary in Bragado, Argentina for further studies. He studied at the seminary from 1945 to 1947 while also helping the Mennonite Central Committee in its work with immigrants arriving from the Soviet Union and Germany. After completing his studies, Martin Duerksen, together with his wife, worked for another year with the Lengua Indians before Martin was ordained and began to work as a minister of a church in Buenos Aires, where he stayed from 1950 to 1963. There, he helped found the Alianza Evangélica Menonita de la Argentina church, as well as working with immigrants at a home founded by the Mennonite Central Committee. Martin Durksen and his family immigrated to Canada in 1967, settling in Manitoba. He was the pastor of the Grunthal Evangelical Mennonite Brethren Church while also teaching at the Steinbach Bible College. He also worked with various immigrant groups in Winnipeg and was a speaker for Mennonite Brethren Communications' German programs from 1969 to 1970. 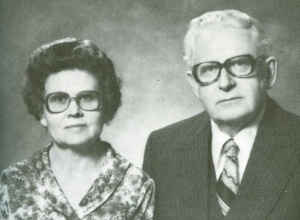 In 1970, the family moved to Winnipeg, where Martin and Kaethe joined first the Elmwood and then the North Kildonan Mennonite Brethren Church. In 1977, Martin Durksen graduated from the University of Winnipeg with a Bachelor of Arts degree, while continuing to work with immigrants to Canada. In 1979, he and Kaethe began work with the Bridge Builders Mission in Ontario, assisting in the Northern Youth Programs. A large part of his work was with aboriginal people in Winnipeg and northwestern Ontario. He also began to write, publishing a book on the Crimea in 1980. With his health failing, Martin Durksen retired in 1989, and in 1993, he entered the Donwood Manor nursing home in Winnipeg. He suffered a stroke on 12 February 1995 and died on 16 February. The funeral was held at the North Kildonan Mennonite Brethren Church. Martin Durksen was a dedicated minister and missionary, committed to serving wherever he went. Throughout his life, he found ways to use his skills for the church and for the communities where he lived and worked, becoming an example for his family and future generations to follow. Canadian Conference of Mennonite Brethren Churches. "Durksen, Martin." http://www.mbconf.ca/home/products_and_services/resources/published_genealogies/personal_papers/durksen_martin/ (accessed 25 November 2009). Durksen, Martin. Die Krim War Unsere Heimat. Winnipeg, MB: Selbstverlag von Martin Durksen, 1980. Mennonite Brethren Herald (April 21, 1995): 33. Mennonitische Rundschau (Mai 1995): 31. Huebert, Helmut T. and Susan Huebert. "Durksen, Martin (1919-1995)." Global Anabaptist Mennonite Encyclopedia Online. January 2010. Web. 23 Apr 2019. http://gameo.org/index.php?title=Durksen,_Martin_(1919-1995)&oldid=143067. Huebert, Helmut T. and Susan Huebert. (January 2010). Durksen, Martin (1919-1995). Global Anabaptist Mennonite Encyclopedia Online. Retrieved 23 April 2019, from http://gameo.org/index.php?title=Durksen,_Martin_(1919-1995)&oldid=143067.